Our bespoke training packages are designed to support a range of businesses, including the manufacturing industry. In 2013/2014 an estimated 629,000 people had an accident in work with 148,000 cases leading to over 7 days absence. In that same period, 133 people were fatally injured in the workplace. Over half of the injuries recorded were linked to falling from a great height, contact with moving machinery or being struck by a vehicle. 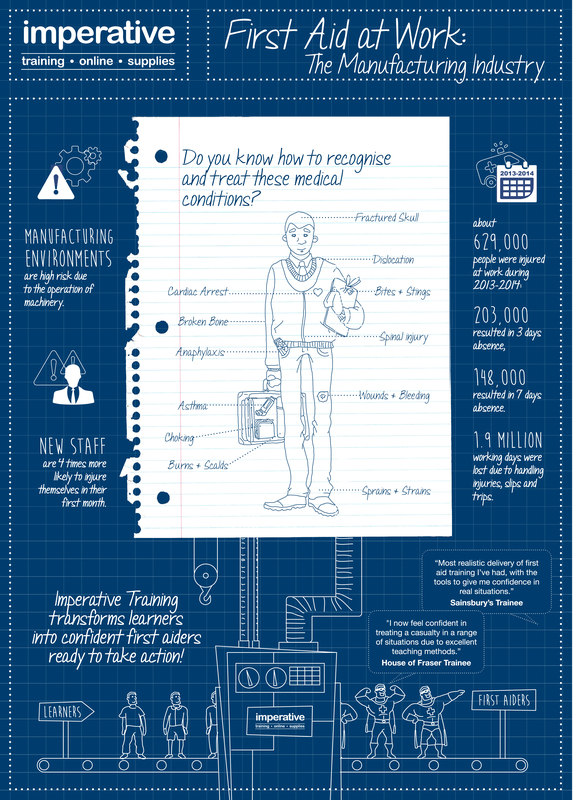 Below we outline some of the key statistics facing the Manufacturing industry and first aid. Far too often individuals have lost their lives because they didn't receive medical attention in time. Qualified first aiders will be able to recognise and treat a number of symptoms, taking swift and appropriate action so that the casualty has the best chance of recovery possible. First aid treatment stops minor accidents from becoming major incidents. Cardiac arrest can happen to anyone no matter their age of level of fitness and over 60,000 people in the UK suffer a cardiac arrest outside of the hospital each year. Effective CPR and defibrillation is the only definitive treatment of cardiac arrest and when administered within 3-5 minutes following a collapse, can increase the chance of survival from 6 - 74%. Purchasing a defibrillator for your workplace will keep your employees heart safe. From Fire Safety to Manual Handling, Food Safety to e-Learning, we provide a suite of courses that can improve the safety of your workplace. Visit our Other Courses We Do page to check out our full offering of training.